We are continuing our series on the costumes of Halychyna, We have arrived at the northernmost county, Sokal'. Here is our map again, so you can orient yourself. ﻿You will notice that there seems to be a scoop taken out of the county. This is the state line with Poland, and the border in that region was renegotiated several times between the state of Poland and the Soviet Government in the late 1940's. 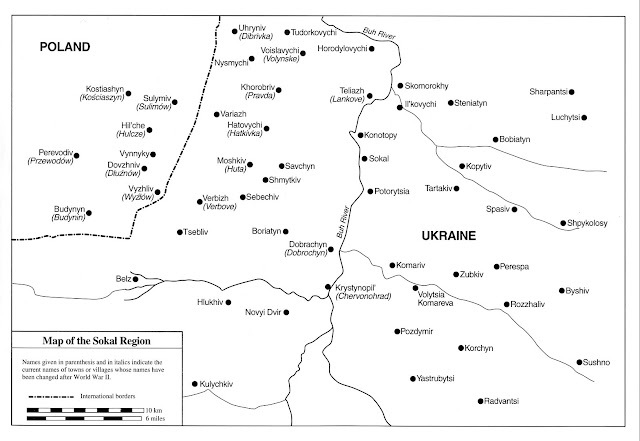 The Sokal' region, ethnically and costumewise also extends further to the west beyond the current Polish border, and also north into Volyn' Oblast, Ivanychi county. 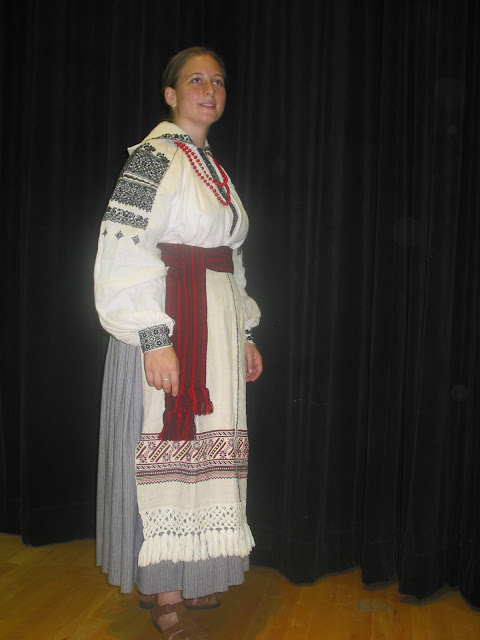 Polish sources refer to this costume by the name of the county center on the Polish side of the border, Hrubieszow, which has a suspiciously Ukrainian sounding name. Hrubieszow is somewhat north of Halychyna. 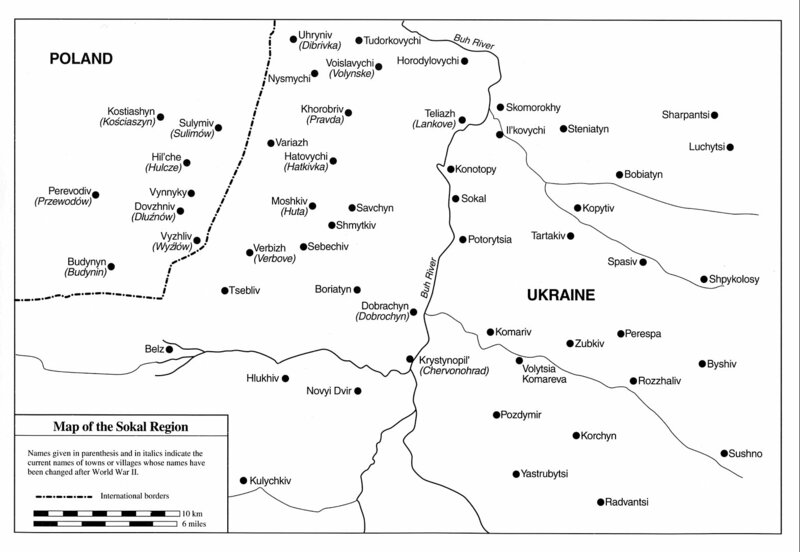 Here is a map showing the important villages in the Sokal' region. 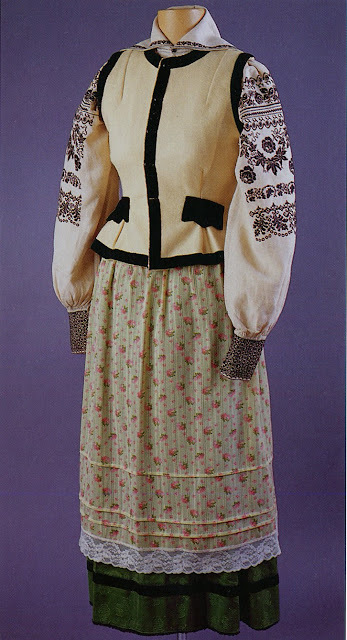 The Sokal' costume falls into the same pattern as the other Halychyna costumes, embroidered chemise, hand printed skirt, maliovanka, linen apron, both later replaced by factory cloth, sash, kamizelka and kerchief. The embroidery of this region is very distinct. Here is a photograph of a pretty girl wearing this costume. You can see the finely gathered maliovanka, which in this region was printed with quite fine, simple designs. You can also see the distinctive embroidery style. 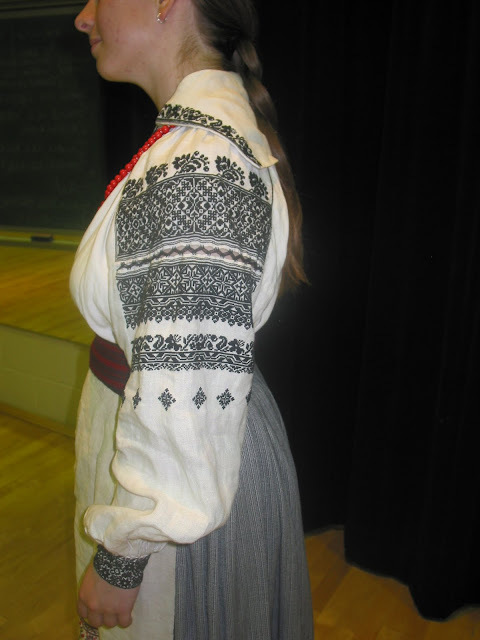 Though colors can sometimes be found in Sokal'/Hrubieszow embroidery, most of the existing examples are black, The cuffs are quite wide, and there is a large lay down sailor type collar, as in the Pidliasshia costume we looked at earlier. The shoulder inset, ustawka, is joined to the sleeve and the front and back panels with a special joining stitch. Often, as here, the embroidery on either side of the joining is identical or mirror image. 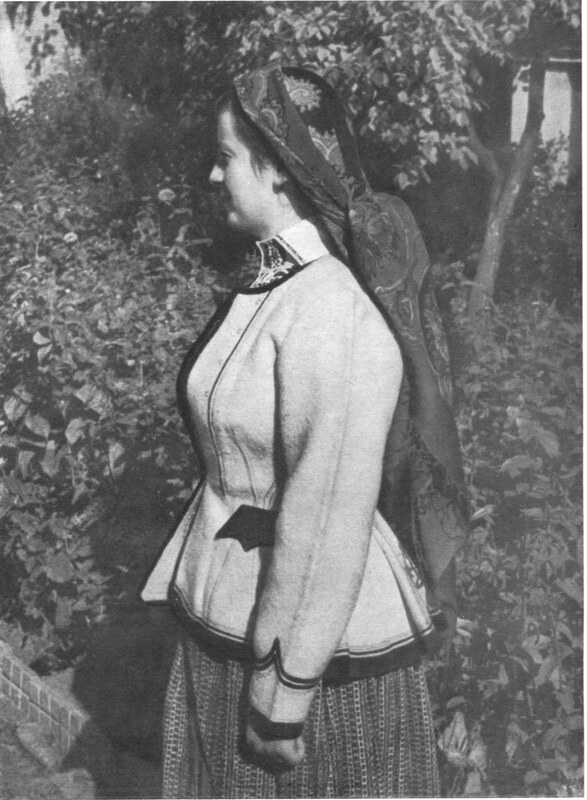 Here is another photo showing the maliovanka, as well as the short jacket known as the kabat. In this region, this was made of quiet colors, often gray, with black velvet trim. You will notice that she is not wearing an apron. This was fashionable in the region for a time. 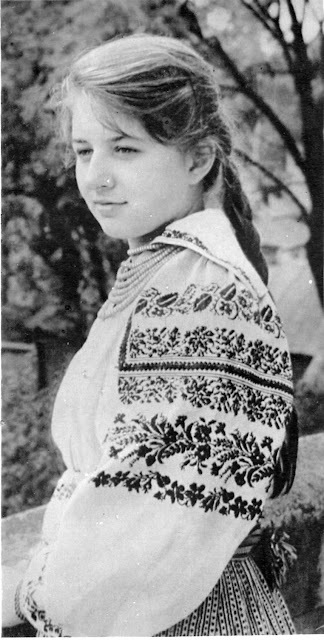 Here is another old photograph showing a woman wearing the maliovanka and the old style linen apron with woven ornament. ﻿Later, both the apron and skirt became made of store-bought cloth. The apron became very wide, ornamented with tucks, ribbons and store-bought lace. Here is a dummy wearing the costume from that period. 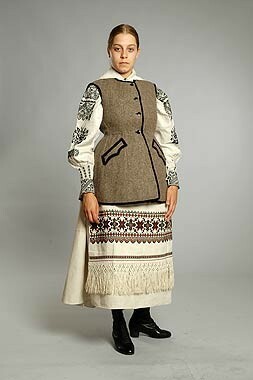 She is also wearing the kamizelka. The cut of the kamizelka is similar to other parts of Halychyna, but again in quiet colors with velvet trim. 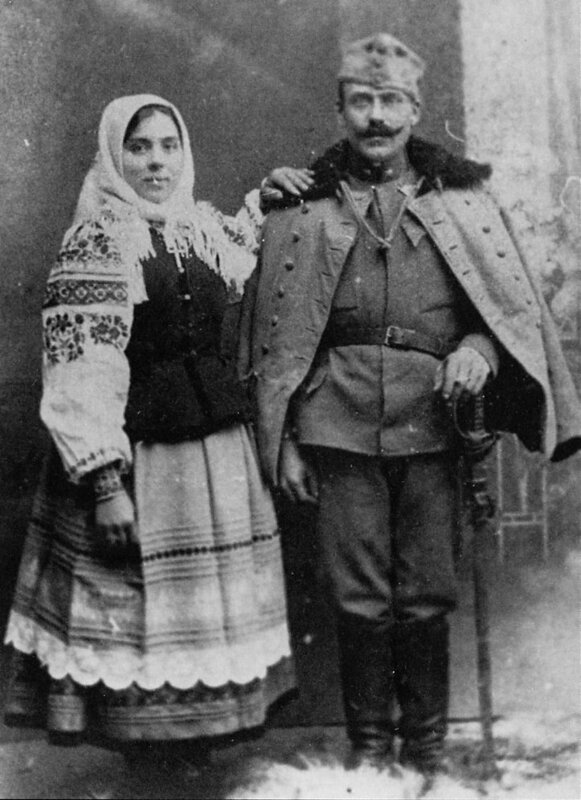 Here is a photograph taken in 1915, This is Kateryna and Teodozij Dulia. She is wearing the kersetka in a dark color, blue or maybe gray, but still trimmed with black velvet. He is in military uniform. ﻿In the 1920's and 30s, folk embroidery became very fashionable. Many women began embroidering elaborate aprons in many colors, [I personally believe that DMC had just started distribution in the area] but of only one loom width, with fringes on the bottom, often knotted in macrame. This was part of the Halychyna 'town costume' of the era, which i will do a posting on later. But the fashion of the apron spread to the Sokal' region as well, as we can see from this woman. She is wearing another, longer type of kamizelka, called the sachek. And here is my friend Annette modeling the Sokal' costume which I made for another friend of mine, Carol. I did not have access to block printed cloth, but i found this material which has a small woven in design which approximates the maliovanka of the region quite well. I made the apron out of a rushnyk i had which had the embroidery on the two ends on opposite sides, making it useless for most things. The chemise i embroidered myself, after designing the embroidery based on traditional motifs. ﻿Carol found the sash online and ordered it. It looks reasonably like the one which i have documentation of. It is not very distinctive, woven with stripes on an inkle loom. The chemise was made in two parts, the lower part, which was under the skirt and did not show, was usually made of a coarser linen. Many of the chemises collected are missing this part. 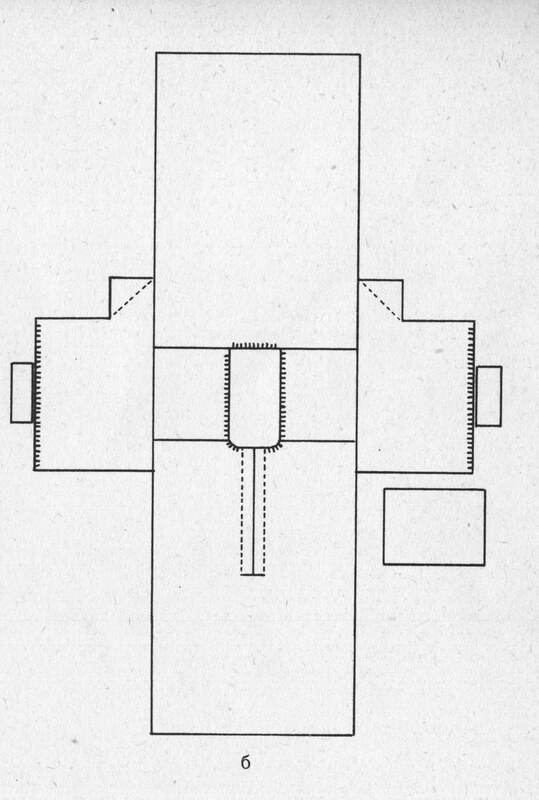 Here is a typical cut for the chemise, which follows the basic Halychyna pattern. ﻿The slit in the front was folded over, so that it could be sewn under with an overlap. For the men's costume, originally the pants were made of the same home printed cloth, with the opening at the waist somewhat to the side in line with the knee, fastened with a button. A shirt, of the same cut as the woman's with embroidery on cuff, collar and front. Unfortunately, the only images i have of the old costume show the men with their overcoats on, as usual. The black cording on the front of the garments in squares is typical for this region. By the late 1920's, the men had abandoned the linen pants in favor of jodphurs and riding boots, derived from the Austrians. In keeping with the fashion in Halychyna, the shirtfronts were embroidered in two wide bands. In this region, there were also wide cuffs and collars. 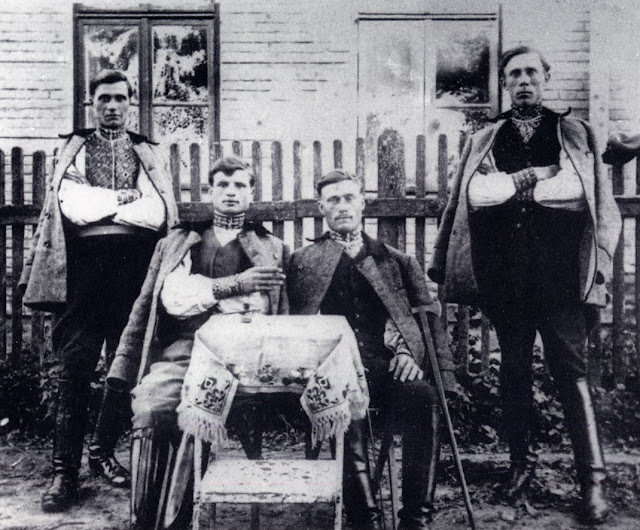 In The Sokal' region at this time, married men started wearing vests, seemingly taken from the Austrians, and so wedding shirts, and shirts for married men had either no embroidery on the fronts, or it only extended a short way, because it would not be visible under the vest. Here is a photo from the late 1920's showing several married men and one unmarried. They also wore short jackets not dissimilar to those worn by the women. I will save a closer examination of the embroidery for the next entry, Sokal' style embroidery is very popular. Here you see another example of my work. Feel free to contact me with requests for research or commissions for sewing or embroidering costumes or other items. Vitam! Great to see someone with similar interests in folk costumes and embroidery. Great research and information done here, love what you have done. 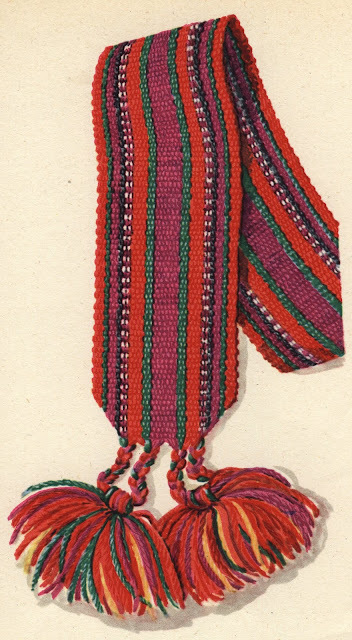 I have posted some on my Polish dolls from: Hrubieszów and Podlaski regional costumes, so I stumbled upon your blog. Wonderful to see the research to include other Eastern European countries as well. Greetings from Polish Folk Dolls. accidentally found your site while looking for something else, but since I have been collecting, studying , teaching and producing Ukrainian embroidery since I was a teen ager, I was intrigued, Wonderful addition to the availability of information on an interesting and culturally important subject and dear to my heart because my Grandfather was born in Sokal I just wanted to add one observation about embroidered rushnyk with embroidery on opposite sides of the ends. This may have once been intended as an Easter Basket cover. One end goes into the base of the basket with the design hanging over , and then the other end covers over the top of the basket and you see the same design now facing upward. Todays "Easter Basket Covers" are a more "modern" invention. Thank you for your interest. Certainly the rushnyk was intended to be folded over for whatever use, perhaps being put under an icon on a stand in Church, or over a bar. It is rather too long and somewhat too narrow for a basket. While the 'basket covers' specially embroidered with lambs, pysanky, crosses, and the like are a recent innovation, what people generally used, and which many people still use are square or rectangular embroidered cloths which most of the time are used on tables or other furniture. These have a longer history.